Part 6: Taylor or Ladapo? A lot of focus has been put on the defence as THE issue that has caused this horrific start – and the defence certainly deserves its fair share of scrutiny – but the one factor that has been constantly overlooked is the midfield. Indeed, the key to improving not only Argyle’s defending but also their attacking fortunes is to get the formula in midfield right. Let’s start with the simple stuff: passing. Positioned in the centre of the pitch – the metaphorical heart of the team – a collective midfield unit needs to be able to pass the ball with direction, speed and purpose. Be it slowing down a match, recycling the ball in attack or executing a precision pass, it is most often the midfield that will set the tempo of the game and determine the areas of the field that the attackers will play in. Put simply, a lack of control of the ball will result in the attackers having to play in a deeper role just to get their foot on the ball. Similarly, a lack of aggressive passing will make it easier for an opposition midfield to block passes into offensive areas and – again – result in the attackers having to come to the midfield to receive the ball. Meanwhile, a lack of precision passing will result in lost possession, which results in a lack of control of the ball, et cetera. Between December and April last year, Argyle had a dominant midfield, and that was mostly due to the collective performances of Fox, Sarcevic and Ness – more about the latter two in the next article. However, it was Fox more than anyone else who helped create this dynamic: with his midfield colleagues pushing forward to create space and time, Fox was able to dictate the play from his deep-lying playmaker (regista) role. Aside from the handful of matches when Argyle opted for a more defensive strategy, the only team to really get a handle on this and stop him from controlling proceedings was Charlton, who used the quicker, stronger and more agile Tariqe Fosu to mark him out of the game and counter attack. Fox’s impact on the team bears out statistically. From his regista role, his average of 42.8 complete passes per-90 minutes last season dwarfed that of any other midfielder. Makasi averaged 31.0, Ness 26.5 and Sarcevic 21.9. Songo’o – the man who has started in that role ahead of Fox this season – averaged just 16.6 passes per-90 from the same regista position. Twice this season, Fox has been the player to complete the highest number of passes: his 58 completed passes against Walsall is the second highest number of successful passes completed in a single game all season, with the 49 he racked up against Doncaster ranking joint third. However, with only five starts from 13, his path to the team has been blocked by Songo’o. When Songo’o plays, not only does he make fewer successful passes than Fox, with a lower accuracy, but the entire midfield makes fewer successful passes with a lower accuracy and the whole team makes fewer passes with a lower accuracy. Along with Carey and Lameiras, Fox is one of the best passers of the ball in the team. By removing him from midfield, Argyle have less control of the ball and a weaker grasp on each individual game. A lot of this is down to positioning. When Argyle are in possession, Fox seems to be almost always aware of the position of the ball, his teammates and himself. When the centre-backs are in possession, he attempts to manoeuvre himself into a space where he can receive a pass and then transfer the ball onto another teammate. When a full-back or wide player is in possession mid-way on the pitch, he attempts to position himself to form a triangle with another teammate to quickly shift the ball from one space into another. When the team are on the attack, he will regularly position himself to intercept any clearances and recycle possession once more. This positioning makes it easy for him to make simple passes that help Argyle retain possession while progressing into better attacking positions. Consider this moment from last season pictured below: Ness ran back to prevent Wimbledon from regaining possession and laid the ball to Fox. Realising this in advance, Fox himself stepped sideways, out of the position that Ness was heading into, to present his teammate with a simple, short, sideways pass into space, reducing the risk of Wimbledon turning over possession. Additionally, by positioning himself there, he opened up four passing lanes: wide right to Threlkeld; between defenders to Carey (positioned off camera); between defenders to Sarcevic, and; furthest left to Lameiras. It seems simple enough, but what Fox just did was position himself not only to make receiving the pass easier, but also moving possession forward easier. 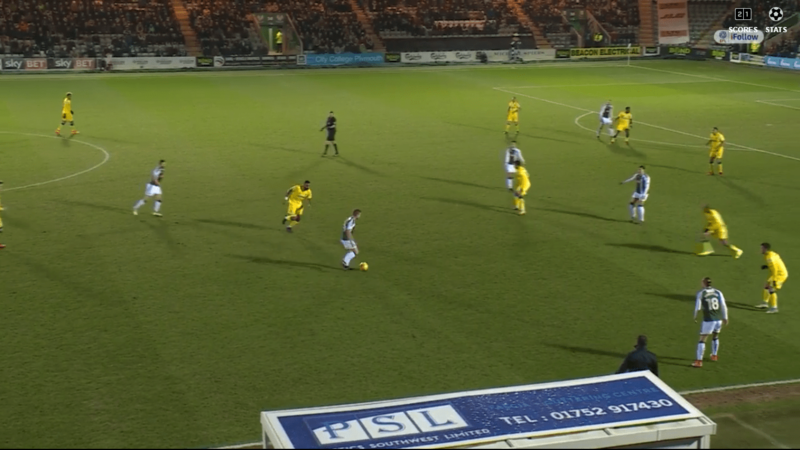 If this clip were to roll on forward, you’d see Fox break Wimbledon’s defensive line with a first time pass between two midfielders to Sarcevic, who turned and – with the defence backtracking – laid the ball to Threlkeld in the box. He crossed to the near-post where Taylor flicked the ball with the outside of his boot narrowly wide. From Wimbledon’s opportunity to counter, Fox’s positioning turned the momentum of the play and helped Argyle create a goal-scoring opportunity. You will rarely, see this kind of movement from Songo’o. He lacks the awareness to position himself best to receive and make simple passes. Whereas Fox seeks out possession, Songo’o is more likely to find the ball at his feet because there were no other passing options for his teammates. That’s not uncommon in the lower leagues – it’s rare that you find defensive midfielder moulded to pass-and-move like Fox in the lower leagues without having the biggest budgets in the division. In Songo’o’s case, you almost get the feeling that he’s thinking of what happens when Argyle lose possession rather than how to help the attack progress – given Argyle’s style of play in his first year at the club, that would not be surprising. But we’re not just talking about possession for possession’s sake. Fox averages 2.05 high-risk passes per-90 minutes, third highest in the team behind Ruben Lameiras and Graham Carey, compared to Songo’o’s 0.46. Fox also has a higher high-risk-to-non-high-risk ratio: for every 100 routine passes he makes, 7.2 are high-risk passes, compared to 1.6 for Songo’o. Let me put it this way: throughout the entire season to date, Songo’o has attempted five high-risk passes; comparatively Fox attempted six (completing four) just on the first day of the season. By starting Songo’o, Adams is doing little more than conceding the midfield battle, allowing the opposition midfield possession and decreasing the amount of time his attackers have on the ball. Say Argyle are lined up 4-3-2-1: the two central midfielders often have to drop backwards to get possession from Songo’o, which allows the opposition midfield to press them further up the pitch; this means that the attacking midfielders have to drop further back to get the ball off of them; this in turn isolates the lone striker. As this scenario plays out, Argyle are forced to play a more direct style of play, hit long balls to the striker, and hope that they create something within two or three phases of play before possession gravitates back towards their own goal and the cycle begins again. Otherwise, when passing out from the back, they have to start their attacks closer and closer to their own goal, and this raises the workload of the attackers: instead of receiving the ball in space in the final-third of the pitch, they must first engineer that space for themselves, and this reduces the probability that they will be able to create a chance. However, starting Songo’o ahead of Fox has caused another ironic yet foreseeable consequence: Argyle’s defence has actually been made worse. You might have been able to guess why from reading the past few paragraphs: enabling your opponents to have a greater share of possession will allow them to hold the ball further up the field and push their full-backs and midfielders into more advanced positions – just as Argyle do when Fox controls possession. This often results in more crosses into the box, more set piece opportunities, more shots at goal and more probing of the edge of the area. In short, more pressure on the defence. This is the Songo’o paradox. Unless you plan to forsake possession, defend deep and hope to create chances on the counter attack – a viable tactic if you’re playing the likes of Bristol City, or even a side like Charlton given their style of play – playing Songo’o in midfield will, on average, cause more problems than it will solve. In attempting to make the team more resolute, instead it is more likely to allow the opposition to ask more questions of the defence, while starving the attackers of possession in dangerous areas. A crude measure though it may be, this is somewhat demonstrated in a couple of oversimplified statistics: when Fox is on the pitch, on average Argyle score a goal every 96.4 minutes and concede one every 60.2 minutes; when Songo’o is on the pitch, Argyle score every 158.2 minutes and concede every 52.7 minutes. This does not take into account the huge complexities and variations between these matches but is a simple way of demonstrating the point that I am making. Argyle can be more protected from conceding goals when Fox is on the pitch because, for the most part, he helps reduce the opposition’s share of possession and that often causes them to position themselves deeper to reflect this, all while allowing Argyle to play in more advanced positions which makes them more likely to create goal-scoring opportunities. Importantly, though Fox’s defensive contribution is lower than that of Songo’o’s, the negative effects his inferior defensive skills are mostly negated by the midfield screen positioned ahead of him. Between them, Sarcevic and Ness, on average, complete 4.48 tackles, win 6.09 duels, make 18.0 interceptions and 0.62 blocks while only being dribbled past 2.53 times. Their work-rate ahead of either Fox or Songo’o massively reduces the defensive requirements of both, and Fox’s case in particular provides the perfect cover for his worrying lack of defensive awareness. Instead, each are generally left to plug holes rather than act as the midfield shield between the opposition’s midfield and attack, with the midfield screen doing most of the heavy lifting. Yet again, though, you have to consider this in the light of the Songo’o paradox. Starting him ahead of Fox increases the likelihood that Argyle will have to perform more defensive actions as they will have less of the ball. Consequently, this will present Songo’o with more opportunities to complete defensive actions such as tacking an opponent or intercepting a pass. However, Songo’o also has major drawbacks even in this position. Despite his undoubtedly superior defensive qualities, he still makes defensive errors at virtually the same rate as Fox (0.57 and 0.56 respectively) and is dribbled past 1.59 times per-90, not that much less than Fox (2.05). In fact, he is dribbled past on average 0.78 times for every tackle he makes, hardly the shining example of a solid defensive midfielder – just compare him to Sarcevic, who’s ratio is a far superior 0.29:1. In fact, without the same midfield screen that so benefits Fox’s, the Cameroonian can similarly appear exposed to quick passing and movement. Songo’o is best in close quarters, in which he can use his strength and solid tackling technique to strip opponents of possession. Playing between the midfield screen and the defence in a 4-3-2-1 was the perfect location for him to isolate stranded attackers between the lines and dispossess them. Alternatively, in a 4-2-3-1, consider a match in which Argyle sat so deep that it restricted the space on the edge of the area and allowed him to do a similar thing, like the recent loss to Charlton. These styles of games also tend to result in lots of crosses into the box, and defending against this kind of attack is another of Songo’o’s best abilities. Putting everything on the line between the attacker and the goal is often when he has put in his best performances, such as the matches away to Bury and Wigan last season, but on fewer and fewer occasions are Argyle meeting sides that play in such a way that introducing Songo’o into the team will benefit the performance. On the balance of play, fielding Songo’o in most circumstances will now have a net negative impact on Argyle’s performances. It’s not that he has no uses – the win at Bristol City was a perfect example of how and when to deploy him to maximum effect – it’s that the style that best suits Argyle’s current squad approaches the antithesis of Songo’o’s footballing abilities. The midfield screen now does the bulk of the defensive work, making his defensive contribution – his greatest strength – less important. It’s not that he can’t cut it at League One level, it’s just that Argyle’s style of play has evolved over his time here and it has effectively made his position in the team redundant. We’ve reached the stage where his inclusion puts the collective defensive and attacking units under more pressure throughout games. Of course, there is more to say about Argyle’s midfield failings so far this season – this article has only focused on one of three midfield positions after all – but that will be addressed in the next part of this series. Ultimately, up to this point, Argyle’s season has been damaged by Fox’s lack of minutes. Without him, Argyle have struggled to build meaningful possession and exert continuous pressure, especially against opponents who Argyle definitely have the quality to beat: Bristol Rovers, Blackpool, Coventry. Starting Songo’o in these games made it easier for these sides to isolate Argyle’s attacking players and create chances at the opposite end of the pitch with their greater share of possession. Indeed, one of my greatest concerns so far this season is that, so far, Fox has only started three matches of thirteen in his favoured regista position. If Argyle are to get players like Carey and Lameiras back to their top form, then they are going to need to see Fox permanently reclaim this position from Songo’o.